This timeline gives New Zealand history from the perspective of a botanist. It is the story of exploration and discovery, of the important events that shaped settlement and the development of plant-based industries, of milestones in botanical research and of the development of public awareness of the value of our natural resources. Please choose a time period of interest from the menu on the left. Your critique of entries as well as suggestions for additions and improvements is solicited. Please send comments to: Dr. L. Jensen, School of Biological Sciences, University of Auckland, Auckland, New Zealand. 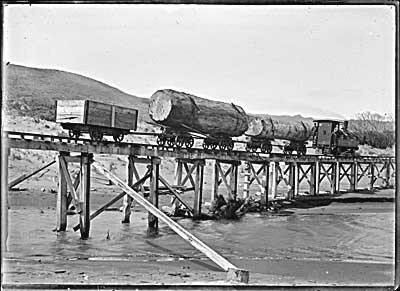 "A" 196 locomotive hauling kauri logs across Maori Creek near Piha. Between 1915-1916. A P Godber Collection, APG-1087-1/2-G. Permission of the Alexander Turnbull Library, Wellington, New Zealand must be obtained before any re-use of this image. 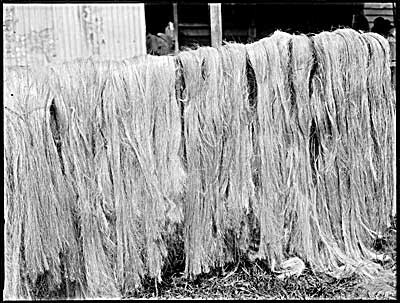 Flax drying ouside shed, Lake Ohia, Northland. Photo taken ca 1910s by Northwood Brothers. Northwood Collection, 1/2-010552-G. Permission of the Alexander Turnbull Library, Wellington, New Zealand must be obtained before any re-use of this image.